During a chat with my friend Pamela, she mentioned to me that people are more likely to share their complaints over a bad product or service than their praise, and will share those complaints with more people than someone passing around a good word. The ratio she quoted: a disgruntled customer will tell three people of his or her bad experience, while a satisfied customer will tell only one. One of my takeaways from this: boy, people sure like to complain. My other takeaway: this theory easily applies to small artisans such as independent authors. Pamela’s context for this was her background in the restaurant industry, but the fact remains, indie writers depend on good word-of-mouth to sell their writing. Our budgets for promoting our work tend to be tiny to non-existent, so positive buzz is as crucial to our success as things like a solid social media presence. I promised myself that in 2014, I would actively spread the word of things I loved instead of whining about things I disliked. I doubt this will lead to a sweeping change in thinking, but if it encourages people to do the same, great — in general; selfishly, for myself; and, less selfishly, for fellow indie authors who could also benefit from someone sharing their love for their stories. 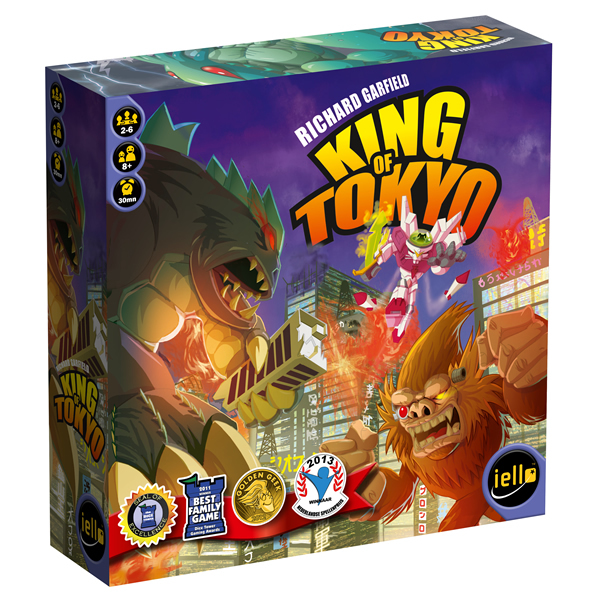 So, here is my first share of the year, and it’s the game King of Tokyo. It’s a light, fast, easy game in which players fight as giant monsters. Think “Destroy All Monsters” by way of Yahtzee. It’s a lot of fun. There are a couple of expansions available, which I’m hoping will add to the basic game rather than complicate it, which tends to happen with expansions. I mean, I love Arkham Horror, but man, the expansions are sometimes, appropriately, maddening.